I am, as always, indebted to Bill Marler for his ongoing commentary – often with slide shows – on recalls of foods contaminated with E. coli O157:H7 and other nasty bugs. He offers ongoing comments about the Christmas eve recall of 248,000 pounds of needle-tenderized steaks. Mechanically tenderized “non-intact” beef? Uh oh. The great thing about intact steak is that harmful contaminants are on the outside surface; the bacteria get killed by the high heat of searing the outside surface. You don’t have to worry about the safety of intact steak because its insides are relatively sterile. But if the steak is pre-treated to tenderize it, watch out! 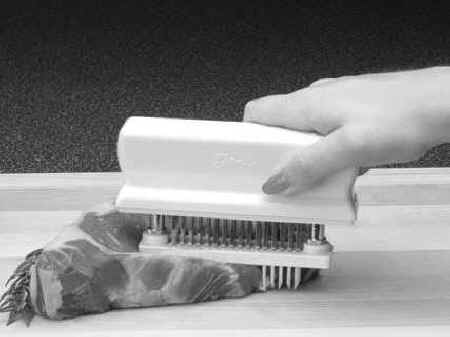 Tenderizing can drive harmful bacteria right into the interior where they won’t get killed unless the steak is thoroughly cooked. Marler provides links to documents showing that the USDA has received plenty of recent warnings about the dangers of undercooked non-intact beef. This is no surprise. In my 2003 book, Safe Food (coming out in a new edition in 2010), I discuss the USDA’s “testing gap” with respect to nonintact beef. In 1999, the USDA said that it wanted to extend its testing requirements for ground beef to mechanically tenderized beef that might be contaminated with E. coli O157:H7. In Safe Food, I explain how the beef industry reacted with “shock, disbelief, and anger” to the USDA’s safety proposal. One industry representative accused the USDA of taking “another step in this administration’s obfuscation of the impeachment activities.” Those activities, of course, referred to the scandal then involving President Clinton and the White House intern, Monica Lewinsky. Then, the meat industry’s position was that pathogens were inherent in raw meat, cooking kills them, and testing would put the industry out of business. Ten years later, the industry position hasn’t budged. The Washington Post (December 30) quotes beef industry representatives arguing that mechanical tenderizing poses no particular health problems. And USA Today (December 30) has produced another long investigative report on the safety of school meals, this one citing plenty of examples of companies that successfully produce or serve safe meat and of countries that do food safety better than we do. In the meantime, the food safety bill is still stuck in Congress. Let’s hope that it gets moving early in 2010. Addendum: The New York Times (online December 30) also is interested in beef produced for the school lunch program. Its reporters investigated safety problems with beef trimmings that had been injected with ammonia to kill bacteria. Two things about the beef trimmings are especially interesting. One person is quoted in the article referring to them as “pink slime.” And they used to be used for pet foods until meat packers figured out that selling them to USDA for school lunches was more profitable. As for the ammonia treatment: surely this is not the same stuff used to clean bathrooms? Apparently so. But using it is tricky. You have to inject enough ammonia to kill bacteria but if you do the meat smells like an ammonia-treated bathroom. If you don’t want the meat to smell, you can’t use as much. But if you don’t use as much, you get Salmonella. This, alas, is another example of regulations not working. Congress: Pass the food safety bill and then start working on a single food safety agency!